Forgive yourself if you trip up and don’t meet a deadline. Life happens and we all do our best to juggle the many obligations we have. 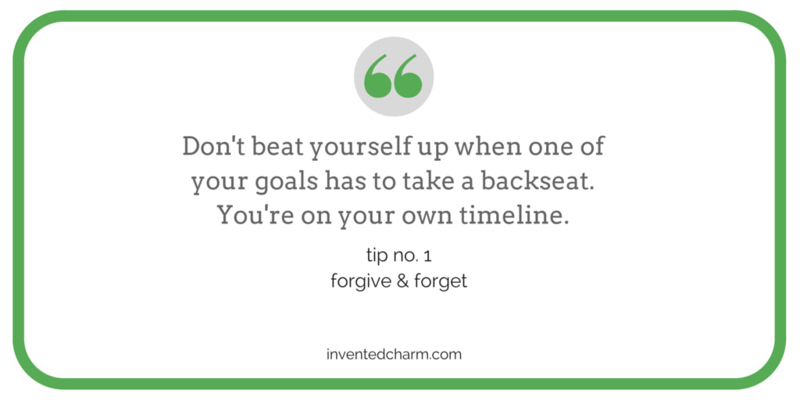 Don’t beat yourself up when one of your goals has to take a backseat. You’re on your own timeline. Forget about the pressure of a calendar, schedule, or list. Maybe it’s the pressure that’s sapping your energy and ability to complete a project or reach a goal. I recently shared that I switched to a new system where I only have three to-do items per day. I have seen a profound shift already in my mood. I have avoided the blahs because my goals are concise and I don’t feel like a loser who can’t get stuff done. If you’re a natural planner and keep a strict calendar and long to-do lists, but you find yourself struggling to meet your self-imposed deadlines, consider adjusting your expectations. If your goal is to write more or spend less or eat a well balanced diet, give yourself grace. You’re still finding your rhythm and establishing a routine that works. Maybe it’s not feasible to post to your blog more than once a week, it might not be possible to slash your monthly bills in your first month alone, and adapting to a healthier lifestyle is a big undertaking. It’s also okay to reflect on your progress and change your goals. I wrote about how I use apps to track my progress and establish healthy habits. 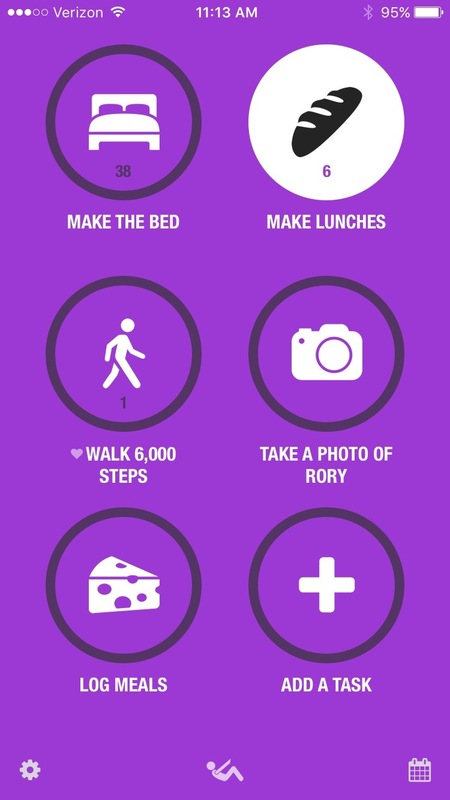 I recently noticed that I nearly always walk 5k steps, so I increased my goal to 6k. But I still struggle to take a picture every day, or I do take a picture but it’s of my dinner and not my kid that’s growing like a weed. Now that I see how many days I’ve missed taking pictures of Rory, I’m going to double down on my efforts and make my goal more specific. When you begin expending energy in a new area, it’s a good idea to simplify wherever possible. This is something we forget to do because in our professional lives that is almost never an option. I have only ever been asked to do more and work harder, and I know you can relate. So it’s even more important in our personal lives to scale back, at least in the short term, while we establish new habits and routines that will help us achieve a much bigger dream. I’ve been trying to make more time for writing, so one of my compromises has been on cleaning. I’ve already shared my cleaning short-cuts, and my absolute favorite is my Roomba. There may be clutter on the kitchen table, but my floor is dust bunny free! My dishes don’t get done first thing in the morning, in fact, they usually only get done right before bed. But I’m more than okay with that concession, because it allows me to carve out daylight hours for writing. 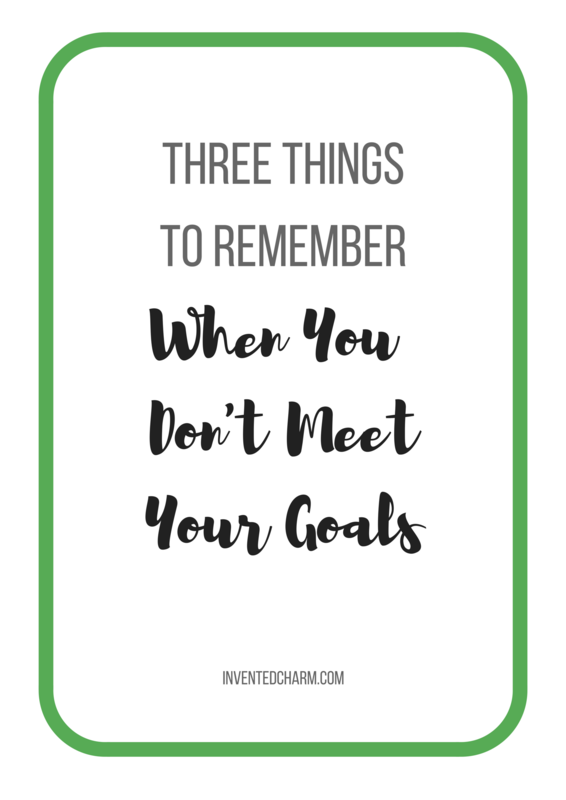 Next time you stumble in meeting a goal or a deadline or you feel like your to-do list is never ending, remember to forgive and forget, adjust your expectations, and keep things simple. I think I’ve got a handle on the forgive part but I really need to work on adjusting my expectations. A list of 3 things is great. I recently bought a tiny little notepad that only has 8 spaces under to do and 5 under to call. I don’t usually cross off everything but it is easier to look at then my longer lists. For years I’ve heard you rave about your roomba, I still think I have too much crap on my floors but maybe I will give myself some time to get stuff off the floor and then ask for a roomba for christmas!